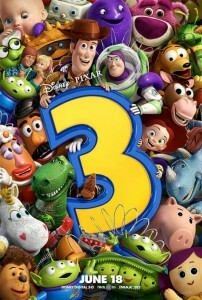 The design and creativity of Toy Story 3 is just on a higher plane than any animated film from any other studio. Pixar remains committed to visual storytelling, not far removed from silent films. The level of detail is stunning. The film’s ending is one of my favorites ever. After the third act twist, this film is on storytelling hyperdrive. Before last week, the king of blockbuster trilogies was either classic Star Wars or Indiana Jones as far as I was concerned. Others preferred the overwrought and overrated Lord of the Rings, and classic cinema enthusiasts sing the praises of the Man With No Name. But we have a new Best Trilogy Ever. Each of the films has a distinct flavor, yet the whole works greater than the sum of the parts because of its distinct thematic arc. Simply phenomenal. The movie parodies and influences in this film are spectacular. Any film buff (especially prison escapes) will be in heaven here. The older this series get — or maybe just the older I get — the better these movies get, and the darker they appear. This movie (intensely) contemplates a variety of toy deaths and afterlives. Every character gets his or her moment. In the centerpiece adventure of the film, all eight or so of the central characters contribute in substantial ways. The new villain (whose identity remains ambiguous until about the halfway point, so I will not reveal it here) is excellent, perhaps the best of the series. Pixar nerds will be in Heaven — there are Easter Eggs galore. Mr. Potato Head, usually content to be a smart-aleck with a couple of good sight gags, gets the funniest joke in the movie: one that ponders what the “essence” of a Potato Head is. Three friends of mine who claimed to not like the second Toy Story admitted to loving the third one, to the point that they’re ready to revisit the second film and reevaluate. So if TS2 didn’t do as much for you as it did for me, don’t be scared to check TS3 out. Trust me that there’s a satisfying, conclusive conclusion to this story arc that brings the series’ central conceit — toys that come to life and are loyal to their owner — full circle. Everyone in the theater over the age of sixteen was on the verge of tears, if not bawling. (And I’m not ashamed to admit that I felt tears streaming down my cheeks.) This film is as much a love letter to nostalgia and childhood as it is an animated adventure. Just see it. Even if you don’t end up as enamored with it as I did, it will surely evoke some response in you. 99% on RottenTomatoes and 96 on MetaCritic means almost nobody has disliked it — or even not loved it. Right now, the film is ranked #11 on the IMDb top 250, with a nontrivial chance to peak in the Top 10 or Top 5 (before inevitably dropping, as always happens on the IMDb list). My point is not that it’s one of the best movies ever, but that pretty much everyone adored it the way they adored movies like The Dark Knight and LotR3. Lastly, and perhaps most importantly, the closing credits includes a Spanish version of You Got a Friend in Me by the Gipsy Kings. So unspeakably awesome.